The Red Epic-X Mysterium-X camera features a 5K sensor capable of 1-120 frames per second at full resolution. The Epic can reach up to 18 stops of dynamic range with HDRx (13.5+ without engaged). Can also shoot 4K (1-150fps), 3K (1-200fps), and 2K (1-300fps). Redcode compression choices of 18:1 to 3:1. 3G-SDI / HD-SDI clean feed, HDMI monitor output, and full compatibility with a wide array of Red and third party DSMC accessories. Redcode RAW files give you the ultimate freedom and control when finished. Capable for professional use for cinematography or still photography. Highly flexible and customizable so you can have just what you need for your production and nothing you don't. And of course features all the professional connections and features one would expect from a high end cinema camera. Different lenses such as Canon EF, Nikon, PL, or Leica-M can be acheived by changing the lens mount. Control is acheived via Red Side Handle, Redmote, and/or Red Pro Touch LCD monitor. 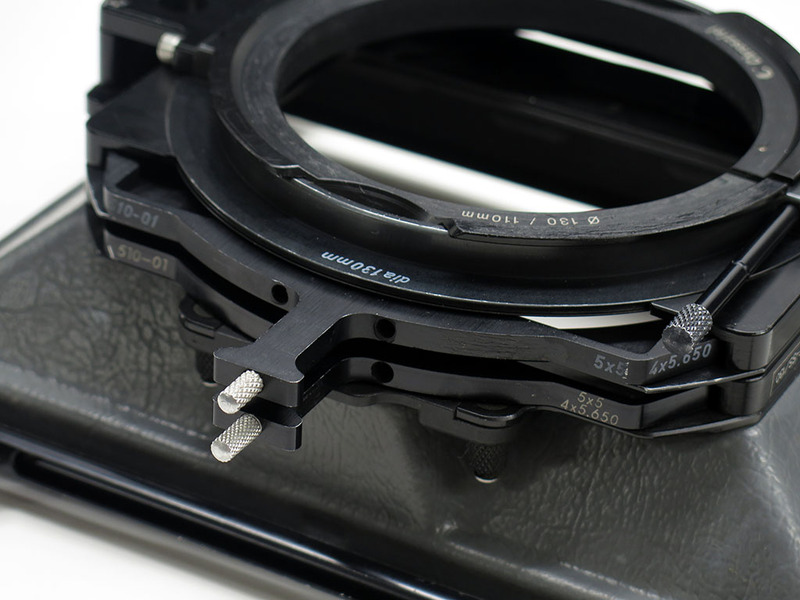 Includes the valuable Red Ti PL mount (titanium for extra strength ideal for heavy/long lenses). This also has the side handle (for camera control, Redvolt battery usage, and of course grip). Lastly comes with the 1.8" Redmag SSD side module and AC power supply. Cosmetically has some marks in finish and paint wear, but overall presentable and clean compared to most. hours of use. Upgraded to the latest version 6.3.106 firmware. 1088 hours logged on hour meter. The internal battery has been replaced so this will keep the time/date code correctly upon restat, unlike most of these on the market (battery replacement is actually a complicated procedure that most users cannot do so this is a valuable thing to be done already). This Epic has all functions, connections, and sensor tested in excellent working order. The Red Raven is a great way to get into the Red DSMC2 ecosystem. Featuring a Dragon sensor with 16.5+ stops of dynamic range. Record 4.5K up to 120fps or 240fps at 2K. Can record Redcode Raw (R3D), Apple ProRes, and Avid DNxHD. Has an integrated Canon EF mount and records onto Red Mini Mag SSD media. The DSMC2 is highly customizable with a variety of I/O expander modules, jetpack, battery plates, monitor, side handle, support/rigs, etc. Note that you need a module for a/v connections, DC, or battery power. If you wish to use a Touch LCD, the new 4.7" can attach directly. 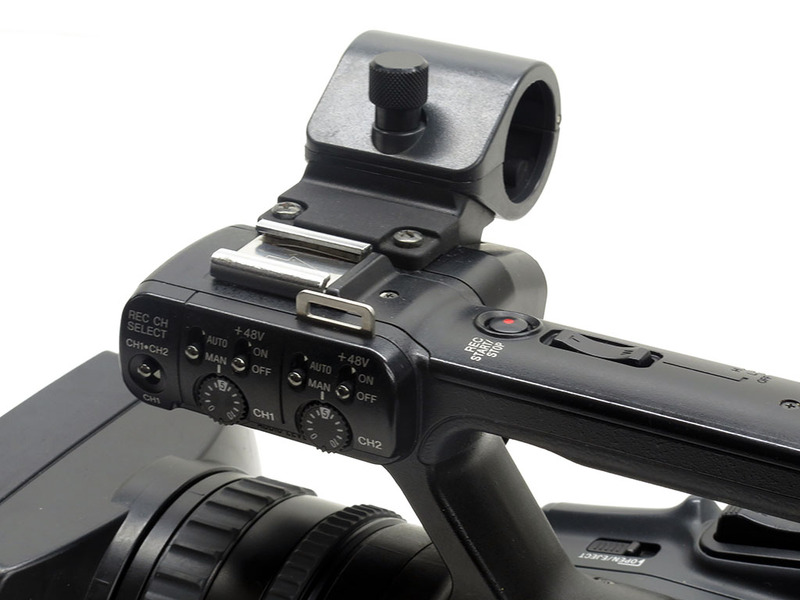 But you can also use a Lemo Adapter A to use DSMC1 Touch LCD or viewfinder with a cable isntead of direct connection. This also has wifi control to control from smartphone with apps like FoolControl. Excellent as a main camera to get into the DSMC2 ecosystem or as a B camera (it usesl the same accessories as the models such as Weapon 6K/8K, Scarlet-W, Dragon-X, Gemini, Helium, and Monstro). This includes the brain only with no accessories such as monitor, module, etc. Latest firmware installed. This only has 37 hours of use logged onto the meter. Cosmetically in mint condition with only a few instances of extremely minor wear such as on underside. This was tested in excellent working with modules, monitor, and minimags to ensure it is in proper working condition - which is no surprise given the very low usage. This is properly registered with us at Red, so ownership transfer will be no problem if desired. 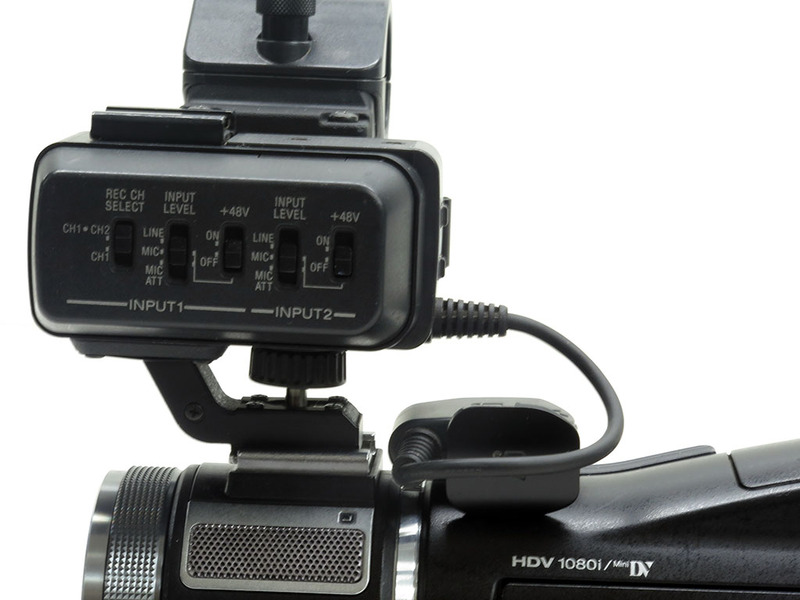 The HVR-A1U fits many professional features in an small "handycam" form factor. 1080i switchable between 60i and cineframe 30P / 24P with 2:3 pulldown. This is NTSC, not PAL. Features include: C-MOS imager, HD to SD downconversion, cinematone gamma and cineframe functions, switchable hdv/dvcam/dv recording (onto mini DV tape), high quality 10x Carl Zeiss lens, lens hood with integrated cap, stabilization system, manual focus ring, 2.7" 16:9 LCD screen with touch screen menus, viewfinder at rear, built-in mic, color bars, nightshot (green low light capability), XLR inputs with phantom power, i.LINK (IEEE 1394), expanded focus, 3 mega pixel still images onto memory stick, and much more. Output connections for monitoring or live output include: HDV/DV firewire / i.link IEEE 1394, component HD / SD, composite. This doesn't have HDMI, but one can always gets a component to HDMI converter for example if they need that. 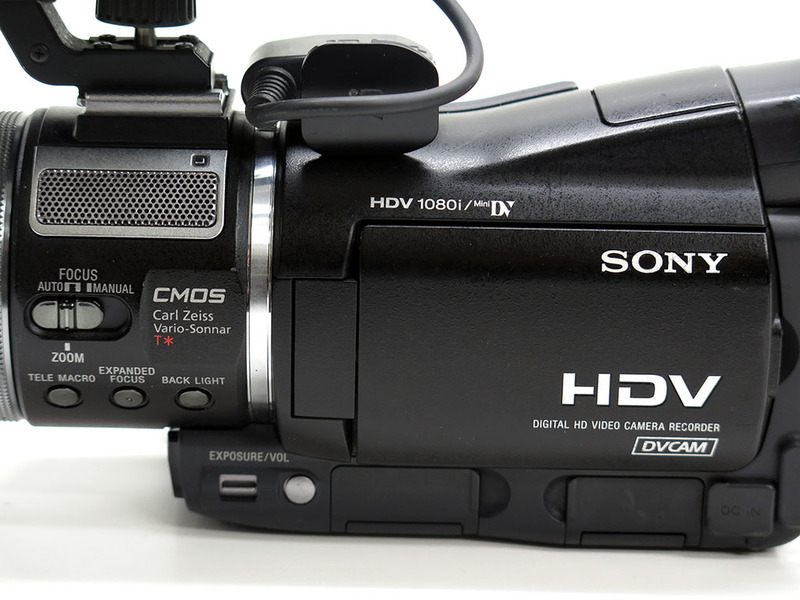 Many use this as an affordable studio / live / streaming camera into a mixer, if they do not want to record onto HDV tape. It is extremely compact which makes it useful in a variety of situations where larger cameras are impossible. This includes XLR adapter, remote, ac adapter / charger, long-life battery, component/av cables, manual (not pictured), lens hood w/ integrated cap. This does not include external mic. Good cosmetic condition with some exterior scratches from transportation, not from usage because this has low hour meter readings. The hood shows a bit of extra wear because it came from a different camera with more usage. The previous owner did etch the serial number into the bottom of the camera. Clean LCD screen. Good lens optics. Hours of use: drum 0x10, tape 0x10, threading 5x10, operation 1x10. So this has had under 10 hours of actual usage, which is quite rare indeed. All functions, features, connections, tape transport are tested in good working order. 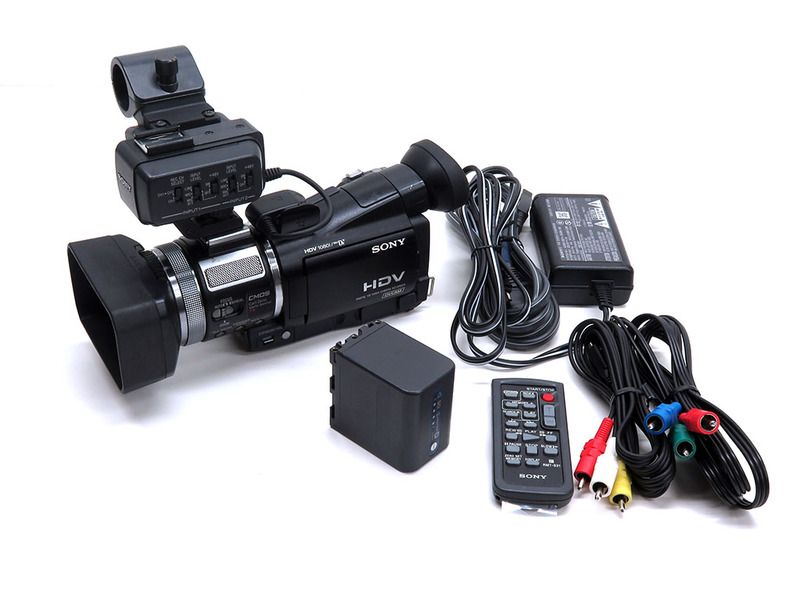 The HVR-V1U 3CMOS HDV camcorder packs a lot of big features in a small package. Captures video at 24P, 30P, and 60i - processed at 1920x1080/60p in full 4:2:2 and recorded as 1080/60i (24P recorded with 2:3 pulldown). This is NTSC only, not PAL. Records onto miniDV / HDV tape. 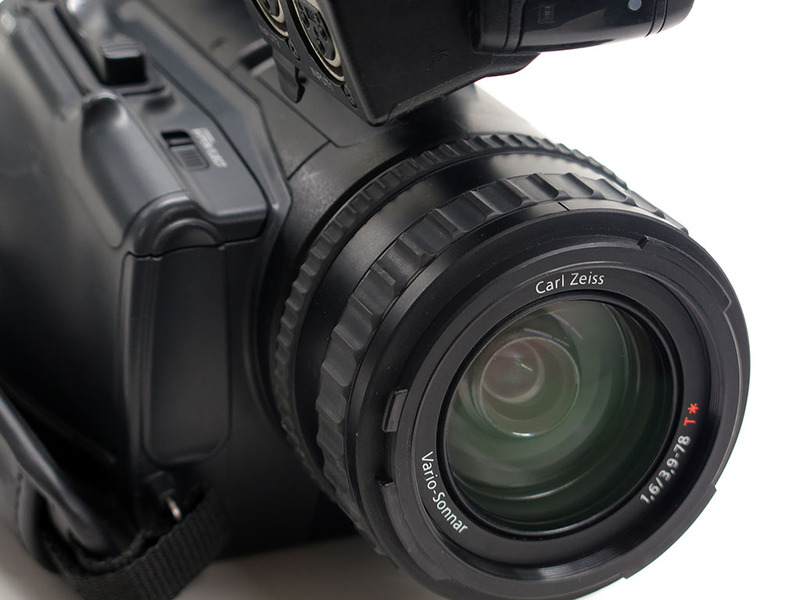 Many professional features include: DVCAM/DV recording, 20x Carl Zeiss Vario-Sonnar T* optical zoom lens, downconversion, 3.5" LCD, rear color viewfinder, manual or automatic control of iris/shutter/focus/zoom/gain, HDMI and i.link interfaces, XLR audio, ClearVid for clear diagonal lines, integrated ND filters, picture profiles, focus peaking / zebra functions, SteadyShot, color bars, gamma settings including Cinematone Gamma, black stretch/compress, knee correction, versatile ergonomic design for handheld or tripod use, and much more. 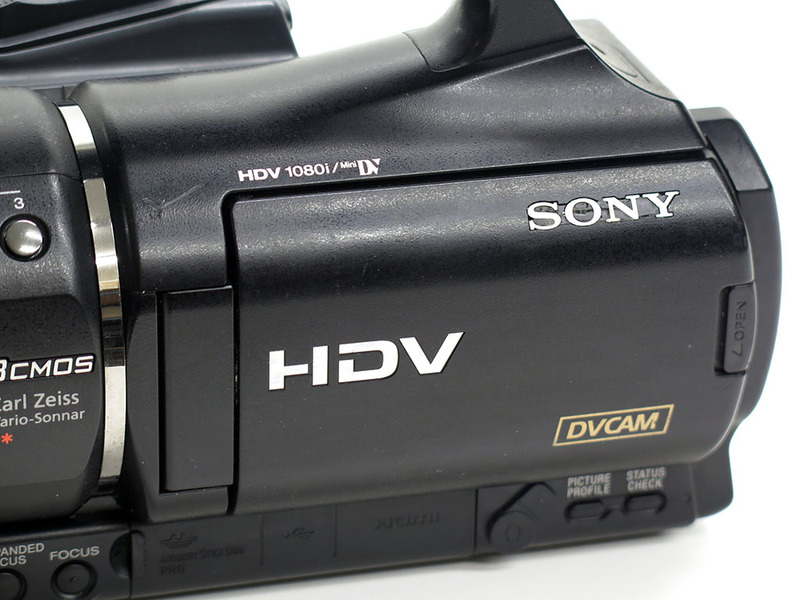 Many use this as an affordable studio / live / streaming camera into a mixer, if they do not want to record onto HDV tape. Low hours of use: Operation 50x10, Drum 15x10, Tape 11x10, Thread 37x10. 150 drum hours is very low usage. Includes ac adapter/charger, small eyecup, av/component cables, and mic holder. 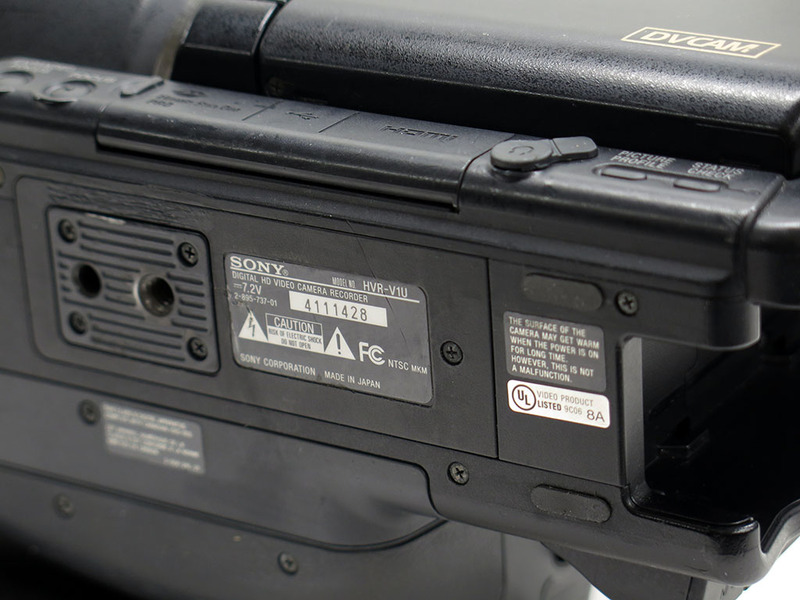 This includes battery, but note it is a generic model, not genuine Sony battery (it does still work but full life not guaranteed). Cosmetically this camera has some scratches and scuffs in various places on the body. 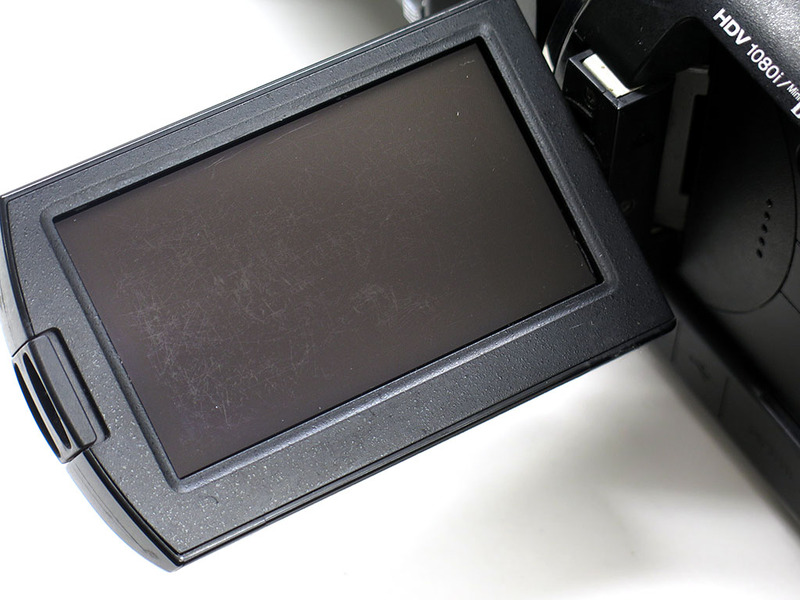 There is also some cleaning scratches on LCD, which are only lightly visible when in use. It's not perfect looking, but it is overall presentable and clean. Optics are clear and without scratches. All functions, features, connections, tape transport are tested in good working order. 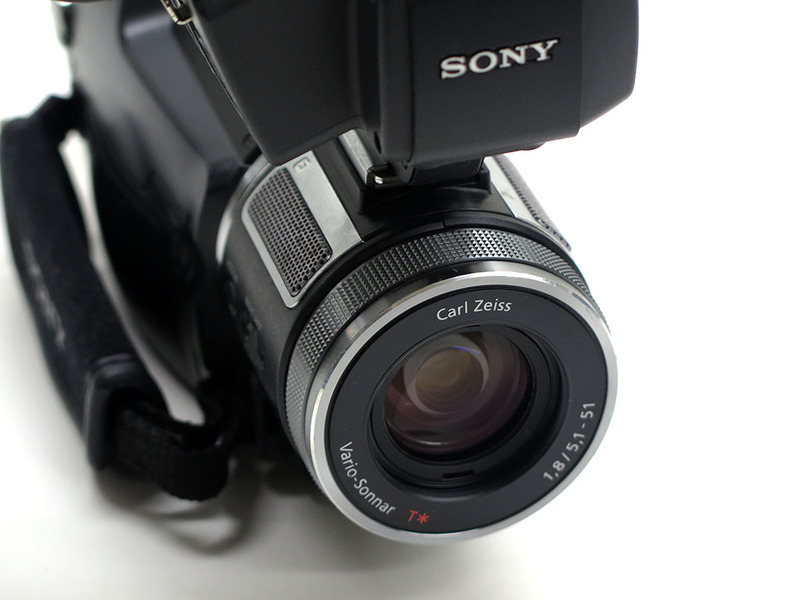 The Sony NEX-FS700 is a Super 35 large sensor video camera with native 4K sensor. Records 1080P (up to 60p) internally on SD card or optional HXR-FMU128. Can output 4:2:2 via HDMI or 3G/HD-SDI to an external recorder. This also has the 4K hardware/software firmware update, so that you can record 4K raw externally (with the addition of the HXR-IFR5 / AXS-R5, Odyssey 7Q, Atomos Shogun Inferno, and other compatible recording systems). 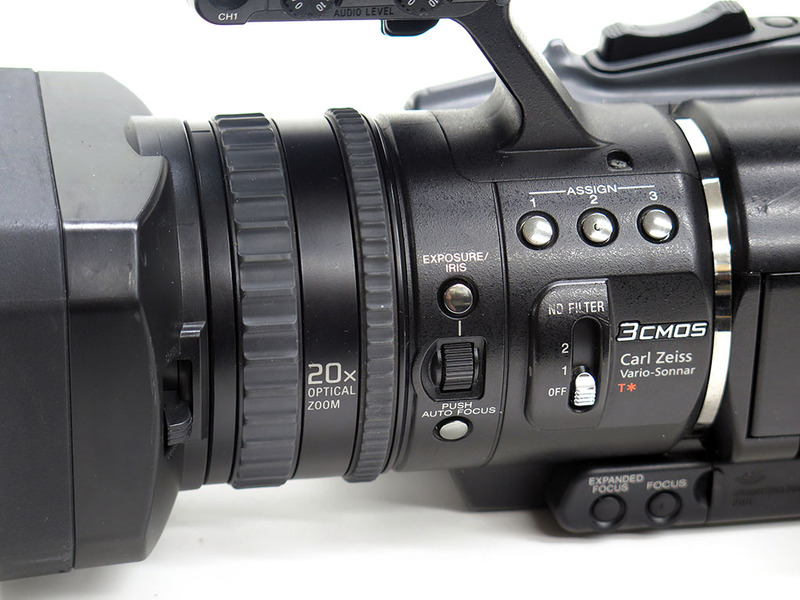 The 4K update makes it functionally the same as the FS700R. The FS700 is notorious for it's super slow motion capability - up to 240fps at full resolution, but can go as high as 480fps or an amazing 960fps at reduced resolution. If using external RAW, it can acheive up to 240fps in 2K RAW and 60fps in 4K RAW (with 4 second bursts up to 120fps in 4K RAW). 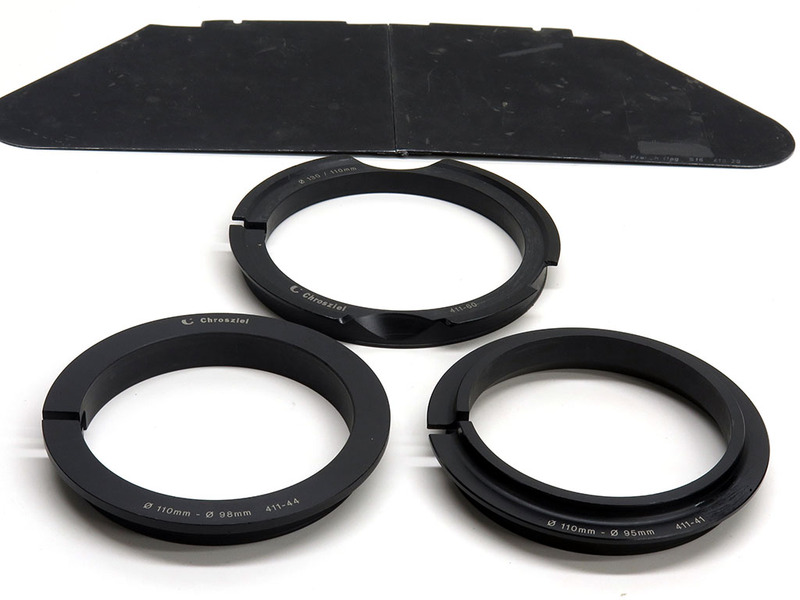 Takes e-mount lenses standard or can be adapted to take Canon EF, Nikon, PL mount, etc. The sensor size is perfect match for cine-style film lenses. Works in worldwide PAL/NTSC framerates. Other features include: 3.5" LCD with detachable viewfinder loupe, built in ND filter, ISO 500 (0db) to ISO 16000 (30db) sensitivity, four HyperGamma settings, auto/manual iris and focus with compatible lenses, dual XLR inputs, and all the picture profile and manual adjustments you'd expect from a high end professional cinema camera. Truly an incredible bang for the buck. This has the 4K RAW output update installed. This makes it functionally identical to the NEX- FS700R. Only 42x10 hours use. Includes charger, geunine battery pack, ac power supply, top handle, side LANC hand grip, mic holder assembly, viewfinder optical loupe, and wireless remote. External microphone not included. Cosmetically overall presentable. There is some paint scuffing and nicks if looking closely. The LCD has a couple very tiny marks that aren't visible when in operation. Overall in above average cosmetic condition compared to most. The lock knob for side handle grip was replaced with a different type, but still works well and locks up tight. This is all fully tested, with all functions/features in excellent working order. 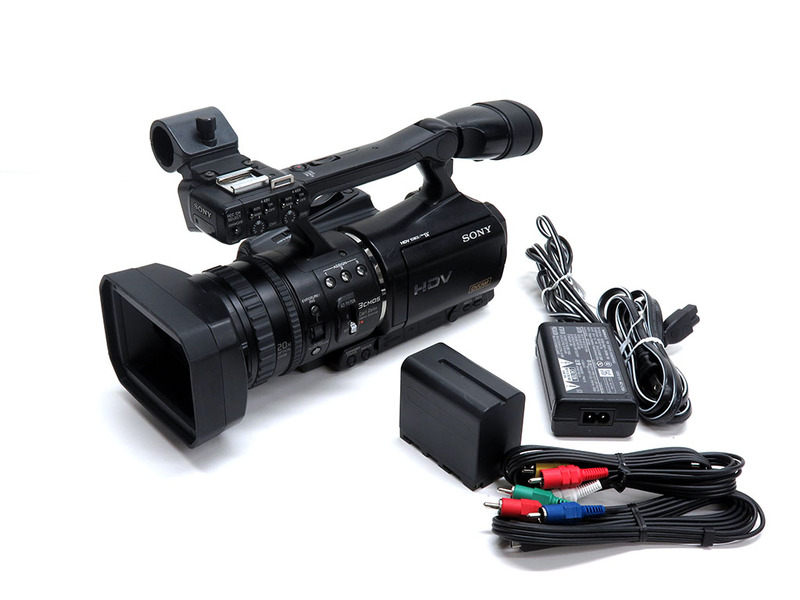 The Sony PDW-700 is a XDCAM HD422 2/3" broadcast ENG camcorder. 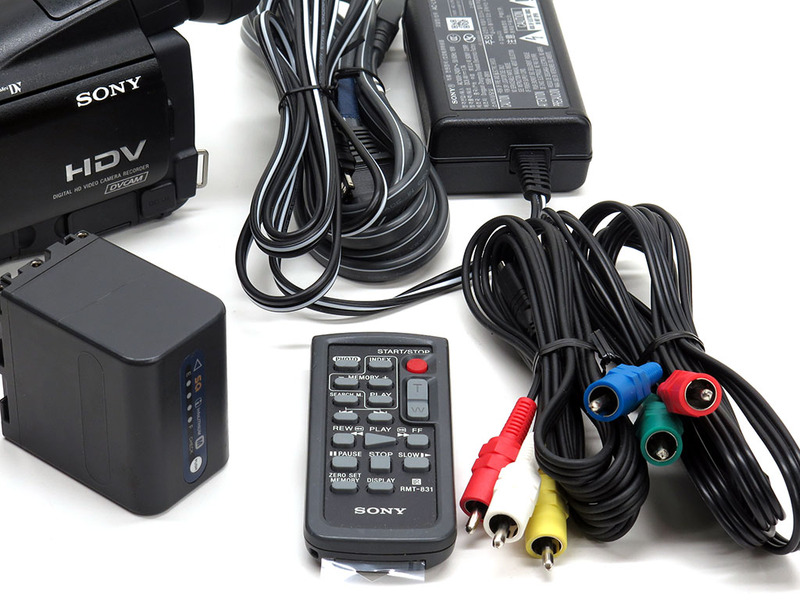 Features Power HAD FX (three 2/3" CCD), 14-bit A/D converter, 50Mbps data rate, 1080P recording at international PAL/NTSC framerates to MXF format, HD/SD conversion and cross conversiion between 1080i / 720P, recording to single and dual layer XDCAM optical discs, ND wheel, thumbnail scene selection, 2x HD-SDI output, i.LINK, ethernet, proxy data, metadata, interval recording, 3.5" LCD, 5-pin XLR stereo front audio and 3-pin XLR rear audio inputs, picture cache recording (up to 30 seconds), slow shutter, smooth gain control, focus magnification, and more. Records in 1080/50i, 1080/59.94i (60i), 1080/25P, 1080/29.97P, 720/50P, and 750/59.94P (60P). The XDCAM HD422 discs are reliable, durable, and long lasting - ideal for archiving. All of this is in a ENG shoulder mount form factor with precise audio/video customization, and ergonomic capabilities you'd expect from a high end broadcast camera. Includes the valuable HDVF-20A viewfinder, a high quality 2" HD viewfinder. Has extra resolution to provide ample detail for discerning focus over cheaper viewfinders. Features contorls for zebra, tally, display/aspect, focus peaking, contrast and brightness. This does show quite a bit of cosmetic paint wear and areas of paint touchups, but looks clean and presentable as a whole - so is a professionally field used camcorder but not abused. The LCD has several scratches in the protective window, which don't much show up when in use (plus the LCD on this is not for critical viewing anyway like the viewfinder or output). The hinged door over the audio controls has been removed for convenience. There is a cosmetic tear in the rubber around the speaker. This has been upgraded to the latest great version 3.2 firmware with all the feature improvements, better pixel correction, and bug fixes that entails. No options are installed. Hours: Operation 1074, Laser 142, spindle 1248, loading 7907. The most important reading is laser hours. These are rated at 6,000+ laser hours, so 142 laser hours means this has very low usage and a ton of life left. Good optical block. All functions/features tested in good working order. Multiple units in similar condition are available. The Sony SRG-300H (black) is a HD PTZ (pan/tilt/zoom) robotic camera. Featuring a 30x optical zoom (4.3-129mm at f/1.6-f/4.7) - thus suitable for medium to large venues such as lecture halls, auditoriums, houses of worship, or stadiums. The small size and remote operation capabilities of the SRG-300H allow for placement where a manually operated camera and operator can not go. Features HD 1080P video at 25P / 29.97P / 50P / 59.94P and 1080i at 50i / 59.94 (60i). Uses 1/2.8" Exmor CMOS sensor with very low light shooting capability (sensitivity of 1.4-lux at F1.6). Installs on a desk, tripod, or ceiling (image flip option available for mounting upside down). Extremely quiet and accurate motor. Remote control of pan, tilt, zoom, auto/manual focus, iris, shutter speed, gain, and extensive image-control menu for fine-tuning. Remote control is available with included Sony IR remote commander for up to 3 units. For more precise control and daisy chaining, RM-BR300 joystick remote control unit over RS-232C/RS-422 VISCA can be used. Also can control with VISCA over IP technlogy for use with controllers such as RM-IP10 or RM-IP500. Comes with Sony's Wide-D for wide dynamic range, enhancing the image with View-DR, while XDNR provides digital noise reduction. Video output is over HDMI. This is lightly used for testing purposes, though does not appear to have been installed. It arrived with factory tape on it to keep tilt stabilized in transport, which has been removed for testing and replaced. Very minor cosmetic wear if looking extremely careful, but basically appears un-used. Includes everything from the factory except original box, such as: IR remote, AC power adaptor and cord, RS-422 connector plug, ceiling brackets, wire rope, screws, and manual (not pictured). Tested in excellent working order with smooth operation, good optical quality, and all connections/features working well. Multiple units are available. The Arri LDS Ultra Prime 14mm T1.9 (K2.52123.0) lens is a PL mount wide angle lens that covers super 35mm format. Creates a sharp image consistent with other Arri lenses such as standard Ultra and Master Primes in color, clarity, and skin tones. Image quality retained across the frame. Features T* XP coating for reduced glare / reflections, Carl Zeiss Distagon optics, close focus of 8.7", fast aperture of T1.9 for shallow depth of field, internal focus design for precise focusing and minimal breathing, minimal aberration, focus marks on both sides of the barrel, industry standard 0.8 mod focus/iris gears, 104mm front barrel diameter, clickless iris ring, and markings in feet. The LDS line specifically features fully floating lens elements that improve performance in close-ups. Also have built-in encoders to communicate with camera via the PL-LDS mount (which is a PL mount with electronic contacts) - providing metadata. This is in very good condition with only minimal paint wear if looking very closely. Well above average cosmetics. Includes front/rear caps. The aperture ring turns smoothly and accurately. The focus ring, however, is noticeably stiffer and slower moving than most examples. However, it is consistent and accurate - it could be ideal for somebody that values precision moreso than quick movement. But bear in mind, it would require service to focus with a similar feel to other examples. Clean glass, no optical problems. Tested in excellent working order. 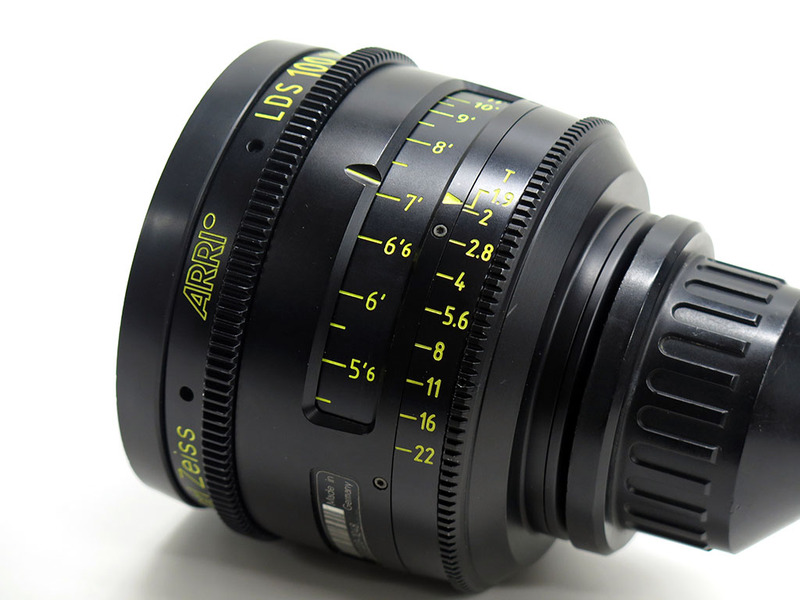 The Arri LDS Ultra Prime 40mm T1.9 (K2.52129.0) lens is a PL mount lens that covers super 35mm format. Creates a sharp image consistent with other Arri lenses such as standard Ultra and Master Primes in color, clarity, and skin tones. Image quality retained across the frame. Features T* XP coating for reduced glare / reflections, Carl Zeiss Distagon optics, close focus of 15", fast aperture of T1.9 for shallow depth of field, internal focus design for precise focusing and minimal breathing, minimal aberration, focus marks on both sides of the barrel, industry standard 0.8 mod focus/iris gears, 104mm front barrel diameter, clickless iris ring, and markings in feet. The LDS line specifically features fully floating lens elements that improve performance in close-ups. Also have built-in encoders to communicate with camera via the PL-LDS mount (which is a PL mount with electronic contacts) - providing metadata. This is in very good condition with only minimal paint wear if looking very closely. Well above average cosmetics. Includes front/rear caps. Rings turn smoothly, consistently, and accurately. Clean glass, no optical problems. Tested in excellent working order. The Arri LDS Ultra Prime 100mm T1.9 (K2.52132.0) lens is a PL mount lens that covers super 35mm format. Creates a sharp image consistent with other Arri lenses such as standard Ultra and Master Primes in color, clarity, and skin tones. Image quality retained across the frame. Features T* XP coating for reduced glare / reflections, Carl Zeiss Sonnar optics, minimum focus distance of 39.4", fast aperture of T1.9 for shallow depth of field, internal focus design for precise focusing and minimal breathing, minimal aberration, focus marks on both sides of the barrel, industry standard 0.8 mod focus/iris gears, 104mm front barrel diameter, clickless iris ring, and markings in feet. The LDS line specifically features fully floating lens elements that improve performance in close-ups. Also have built-in encoders to communicate with camera via the PL-LDS mount (which is a PL mount with electronic contacts) - providing metadata. Very good condition with only minimal paint wear if looking closely. Well above average cosmetics. Includes front/rear caps. Aperture and focus rings turn smoothly, accurately, and freely. There is a slight inconsistency in tension in the focus ring, which could cause marks to be missed with very fast movement, but overall would not be noticeable or cause problems for most users - it has a typical feel similar to most examples of this lens. Clean glass, no optical problems. Tested in excellent working order. 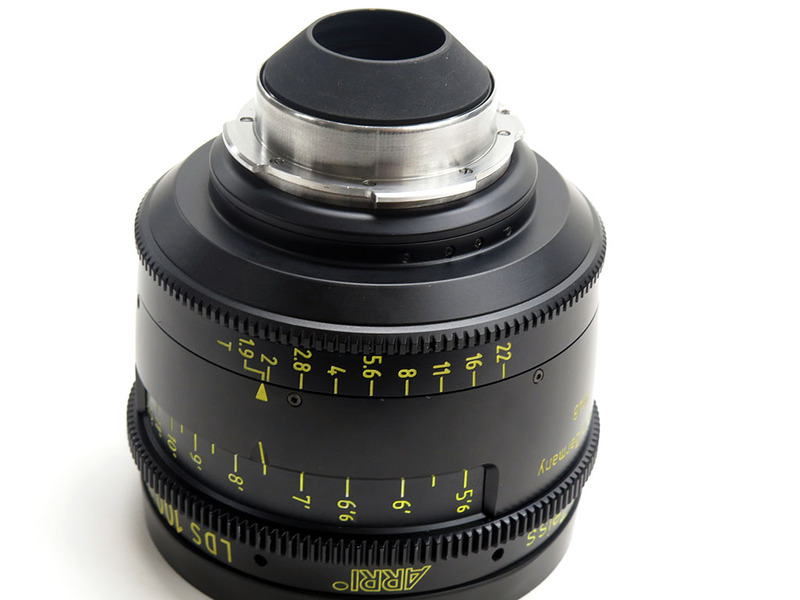 The Arri Ultra Prime 20mm T1.9 (K2.47325.0) is a PL mount wide angle prime lens that covers super 35mm format. Compact, lightweight, and optically matched to the Master Prime series. Provides the optimal image quality, vivid colors, clarity, sharpness, and skin tones which Arri / Zeiss is famous for. Image quality retained across the frame. Features T* XP coating for reduced glare / reflections, Carl Zeiss Distagon optics, close focus of 11", fast aperture of T1.9 for shallow depth of field, minimal focus breathing and aberration, focus marks on both sides of barrel, industry standard 0.8 mod focus/iris gears, 95mm front barrel diameter, clickless iris ring, markings in feet. This is in very good condition with only minimal paint wear on exterior one would expect. Includes front/rear caps. Rings turn smoothly and consistently. Clean glass, no optical problems. In excellent working order. The Arri Ultra Prime 85mm T1.9 (K2.47331.0) is a PL mount prime lens that covers super 35mm format. Compact, lightweight, and optically matched to the Master Prime series. Provides the optimal image quality, vivid colors, clarity, sharpness, and skin tones which Arri / Zeiss is famous for. Image quality retained across the frame. Features T* XP coating for reduced glare / reflections, Carl Zeiss Planar optics, MOD of 3' (0.9m), fast aperture of T1.9 for shallow depth of field, minimal focus breathing and aberration, focus marks on both sides of barrel, industry standard 0.8 mod focus/iris gears, 95mm front barrel diameter, clickless iris ring, markings in feet. 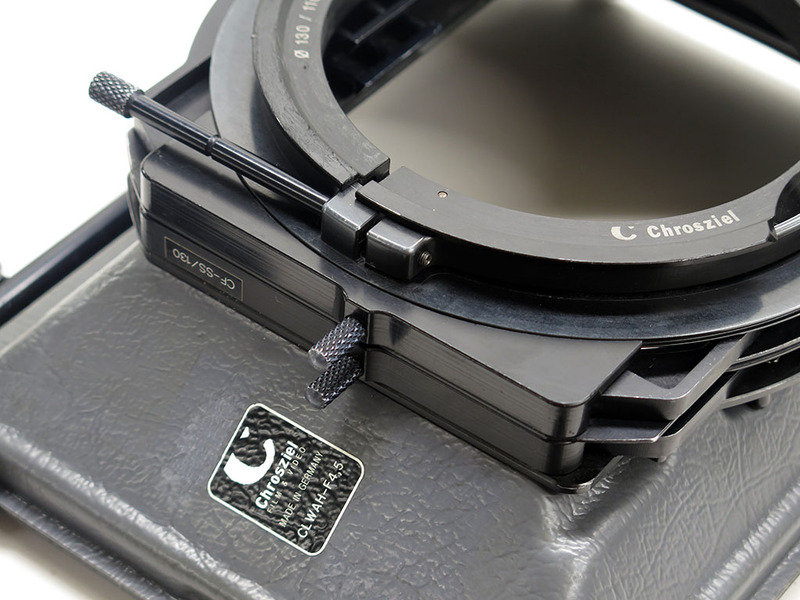 This is for a Chrosziel CLWAH-F4,5 mattebox system, also known as the 415-02F110 or MB 415. Designed for any Canon, Fujinon, or other brand of lenses, even wide angle lenses with focal length up to 4.5mm. Dual stage filter stages - 1 fixed and 1 rotating filter stage. 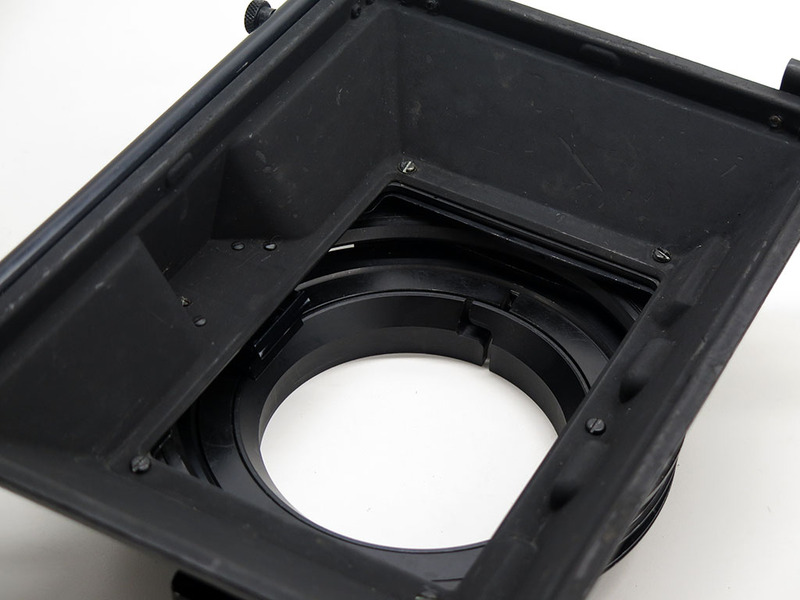 This is a clip-on style mattebox for use without rods. 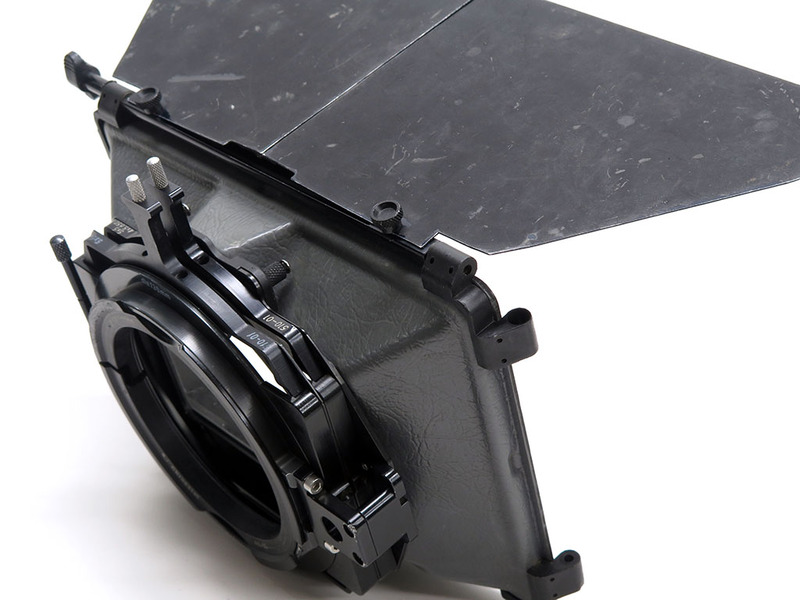 This is a robust and professional matte box system, not a chintzy knock off. 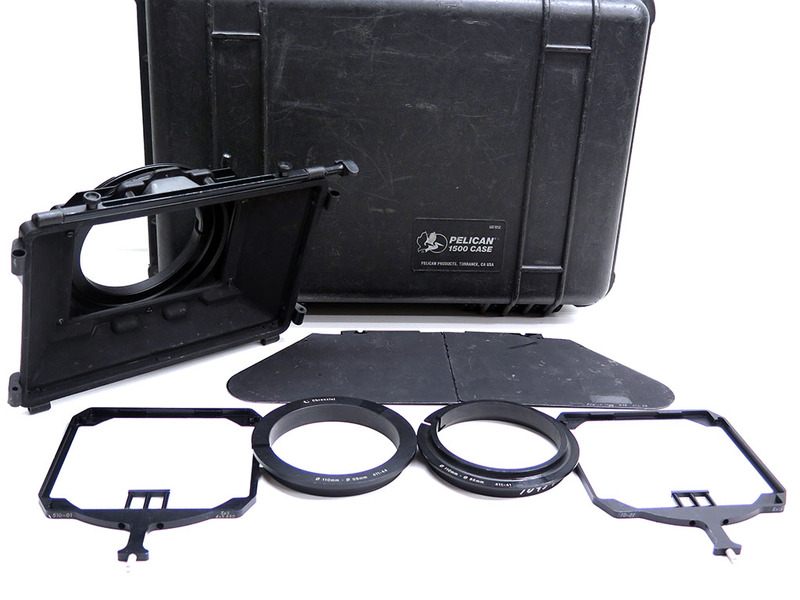 This includes the CLWAH-F4.5 sunshade housing, 410-31 4x4/4x5.650 filter holder, 510-01 5x5/4x5.650 filter holder, 130-110mm intermediate ring, 110mm-98mm stepdown ring, 110mm-95mm stepdown ring, and foldable top french flag. So this can accomodate 130mm, 110mm, 98mm, and 95mm diameter lenses (though you can obtain other stepdown rings if your needs differ). Even includes a hard case to carry it, model Pelican 1500. Shows noticeable cosmetic wear and paint touchups, but no damage. In very good working order. Multiple units available. The Fujinon HA16x6.3BERM is a 2/3" ENG B4 style zoom lens w/ 2x extender. This is a member of the "premier series", using Fujinon's highest quality glass/optics. This is a relatively newer model in the Fujinon line with their most modern technology and features. Perfect for any 2/3" camcorder such as the F23, AG-HPX500, AG-HPX600, AJ-HPX2000, AJ-HPX2700, AJ-HPX3000, AJ-HPX3100, AJ-HPX3700, HDC-930, HDC-950, HDC-1500R, HDC-1700, HDC-2400, HDC-2500, HDC-2550, HDC-2570, HDC-3100, HDC-3170, HDC-3300R, HDC-3500, HDC-4300, HDC-P1, HDW-F900R, HSC-100R, HSC-300R, HXC-FB75, HXC-FB80, PDW-700, PDW-F800, PMW-350, PMW-500, PXW-X400, PXW-X500, PXW-Z450, and many more. With the 2x extender engaged to prevent vignetting, this could be a good choice for adapting to micro 4/3 (MFT) camera like GH4/GH5, or Sony a7S / a7R II. There is also B4 adapters available for Sony PXW-FS5, PXW-FS7, PMW-F5/F55, Canon C300 mark II and many others. 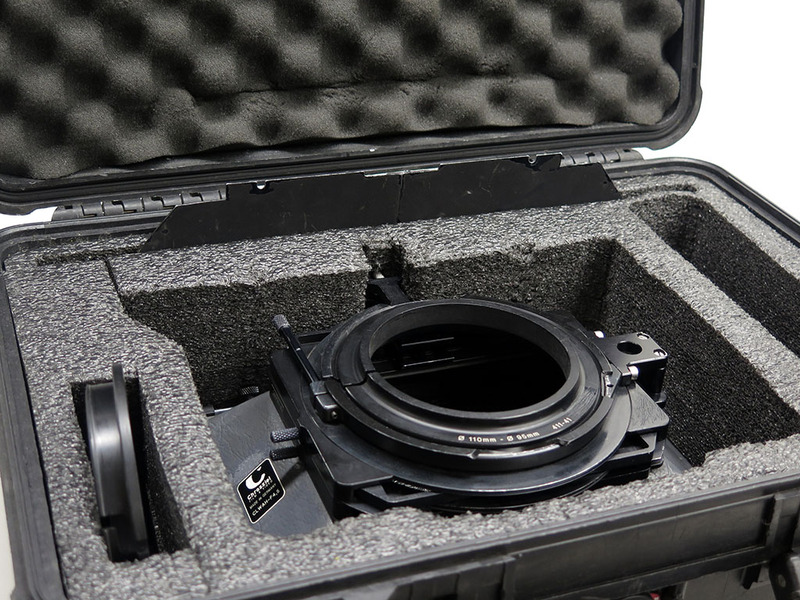 This is also ideal for the Blackmagic URSA Broadcast or Mini 4.6K / Pro with B4 mount installed. Please research the technical limitations of adapting a 2/3" B4 lens on your specific camera if it is not natively designed for 2/3" B4 lenses, to make sure you will find the trade-offs acceptable compared to the benefits. This high definition 16x lens features a focal-length range of 6.3-101mm (12.6-202mm with extender). This is a useful range from fairly wide to telephoto. Fast maximum aperture of f/1.8. Macro functionality for focusing on objects close to lens. Takes 107mm filters in the lens hood. Internal focus designs to minimize focus breathing. Features servo zoom, manual focus, 16-bit encoder and 32-bit RISC processor in the lens, innerfocus, quickzoom (for rapid focus checking), zoom limit, zoom speed dial, focused intelligent network diagnosis. This is the M6 model as well, which features a software function developed for robotics applications and is a less costly option to Fujinon's Quick Frame option w/ 16-bit encoder and 20-pin connector - so if you need robotics functions this is capable. But of course this is perfect for anyl 2/3" ENG camera user as well. Includes lens hood, hood cap, rear cap. Overall in above average cosmetic condition, with a few marks on grip (rubberized coating here is more prone to cosmetic wear). Clean glass and proper optical quality. Servos work correctly and manual rings turn very smoothly/evenly. Overall excellent working order. The Fujinon HAe10x10-F is a 2/3" B4 cine style HD zoom lens. This does not have ENG servo (manual zoom/focus/aperture), but is optimized for cinematography use with high quality optics and industry standard gears for use of follow focus and 160 degree zoom and 280 degree focus rotation. This is a member of the "premier series", using Fujinon's highest quality glass/optics. The overall high quality of the HAe10x10 zoom makes the lens ideal for episodic TV, commercials, green-screen shoots, independent film production, or any other cinematic projects that employ 2/3" HD cameras. E series lenses offer top optical performance one would expect from primes. This high definition 10x lens features a focal-length range of 10-100mm. Fast maximum aperture of T1.8. Internal focus designs to minimize focus breathing and ramping. Perfect for any 2/3" camcorder such as the F23, AG-HPX500, AG-HPX600, AJ-HPX2000, AJ-HPX2700, AJ-HPX3000, AJ-HPX3100, AJ-HPX3700, HDC-930, HDC-950, HDC-1500R, HDC-1700, HDC-2400, HDC-2500, HDC-2550, HDC-2570, HDC-3100, HDC-3170, HDC-3300R, HDC-3500, HDC-4300, HDC-P1, HDW-F900R, HSC-100R, HSC-300R, HXC-FB75, HXC-FB80, PDW-700, PDW-F800, PMW-350, PMW-500, PXW-X400, PXW-X500, PXW-Z450, and many more. This could be a good choice for adapting to Panasonic GH4/GH5, Sony a7S / a7R II, PXW-FS5, PXW-FS7, PMW-F5/F55, Canon C300 mark II, Blackmagic URSA Broadcast / Mini 4.6K / Pro, etc. Please research the technical limitations of adapting a 2/3" B4 lens on your specific camera if it is not natively designed for 2/3" B4 lenses, to make sure you will find the trade-offs acceptable compared to the benefits. This is a large and heavy lens, so it is assumed you will likely provide lens support / rods to support the weight. 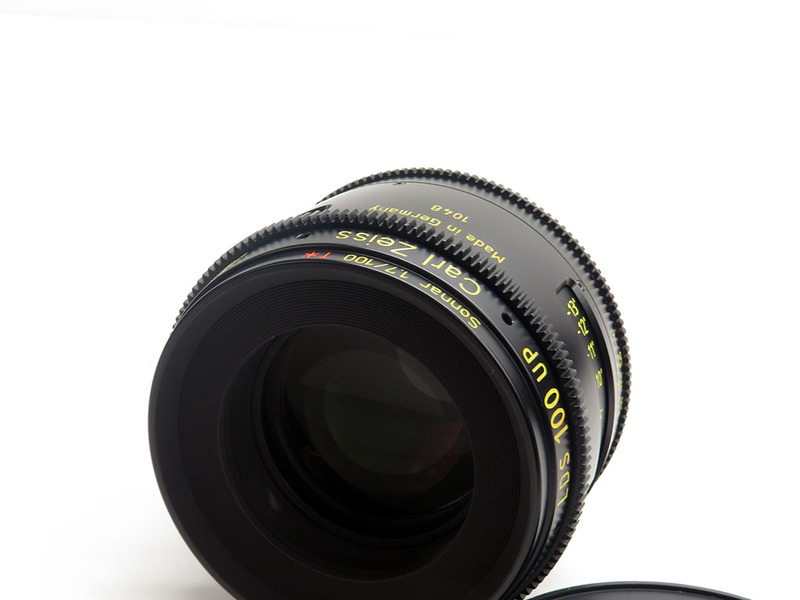 This is a cinema lens, so most would use a rig for things like mattebox or follow focus that also provides support. Includes front and rear caps. Also comes in a valuable custom Omega hard case for protection in shipping and transit. Overall in above average cosmetic condition, with just a few minor marks on barrel if looking carefully. Clean glass and proper sharp optical quality. Manual rings turn smoothly, accurately, and evenly. Note the zoom is not quite as consistent and smooth as the focus, though it does work acceptably (the focus ring is far more important anyway to be perfect). Overall a very fine example of this lens. The DSMC VV AL Canon Lens Mount (model 725-0030) allows you to use Canon EF-S and full frame Canon EF compatible lenses with your DSMC2 8K VV camera brain (Weapon Monstro 8K VV). Constructed from lightweight aluminum. Supports autofocus and electronic iris control with compatible lenses. Touch focus enabled for select lenses. Uses a dual-ring lock system to securely attach lens. Captive screws provide a secure attachment and convenient removal. This mount is optimized for VV sensor. Though it can be used with smaller sensors, there could be unintended artifacts, so it is not reccomended. This is brand new and sealed in factory box. The Zeiss CP.3 XD 15mm T2.9 (model 2189-367) is a compact prime full-frame sensor coverage lens in PL mount, with marking in meters. This is the newer upgrade to the CP.2 with an updated form factor to be more similar to Ultra Prime lenses, improved mechanics, better T* lens coatings, even weight distribution. Increased anti-reflection masking for increased contrast and reduced flare. 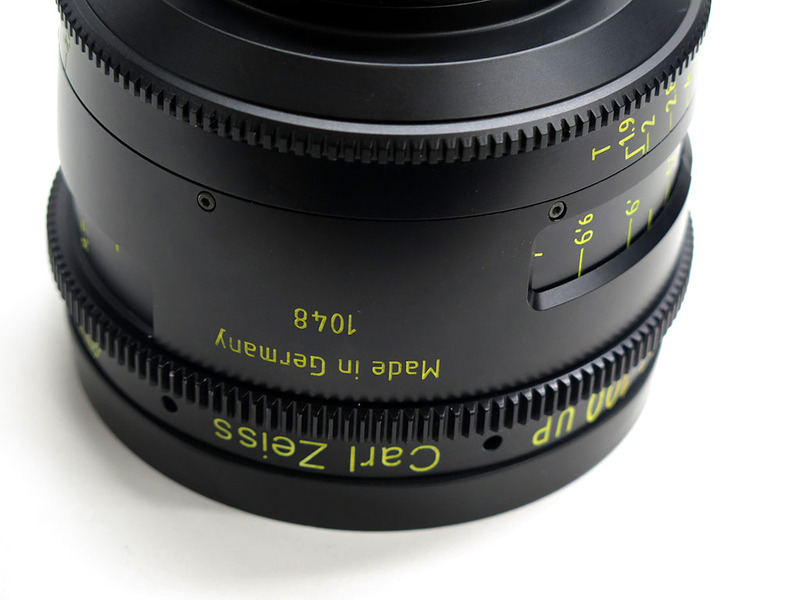 Has the signature Zeiss look, to match up well with other CP.3 lenses as well as any types of high-end Zeiss cinema lens. Features Zeiss eXtended Data (XD) technology combined with Cooke's /i lens metadata protocol. All information is transmitted in real-time via the 12 o' clock position on the PL mount or the 4-pin LEMO port. This technology allows for accurate focus pulling when combined with a rangefinder or recording alongside footage and applied in post. In particular, the recording of ZEISS-specific datasets enable DITs using Pomfort or DaVinci Resolve software to analyze recorded footage to remove distortion and shading in post-production (saves time especially for productions than plan on using VFX). Has the standard 95mm front diameter to be compatible easily with matte boxes, follow focus, and lens supports. 14-blade iris for pleasing round bokeh. Clickless iris ring and geared focus and iris control round out this very impressive lens. Includes front/rear caps. This is the version with markings in meters, not feet. Cosmetically in mint condition with extremely little wear or use, imperfections only noticed if looking carefully. Clean optics inside and out. Rings turn smoothly, accurately, and consistently. Tested in excellent working order. The Zeiss 28-80mm T2.9 Compact Zoom CZ.2 PL mount cinema lens (model 2008-988) is a zoom lens optimized for motion picture production.Offers full frame (36x24mm) coverage with no focus shift over zoom range. 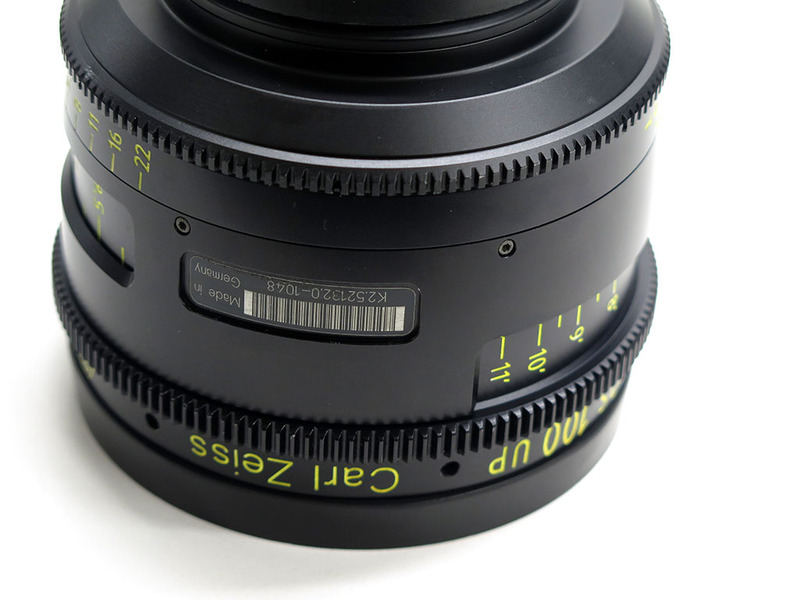 Cine-style housing features calibrated focus scales and industry standard gearing for focus, zoom, and iris. Only 7.72" long and 5.5lb weight, making it ideal for applications such as handheld and Steadicam. Utilizes T* coating and internal light traps to supress flares and a circular 18-blade aperture for attractive bokeh. Imperial markings (in feet). 4K+ resolution ready high quality optics. 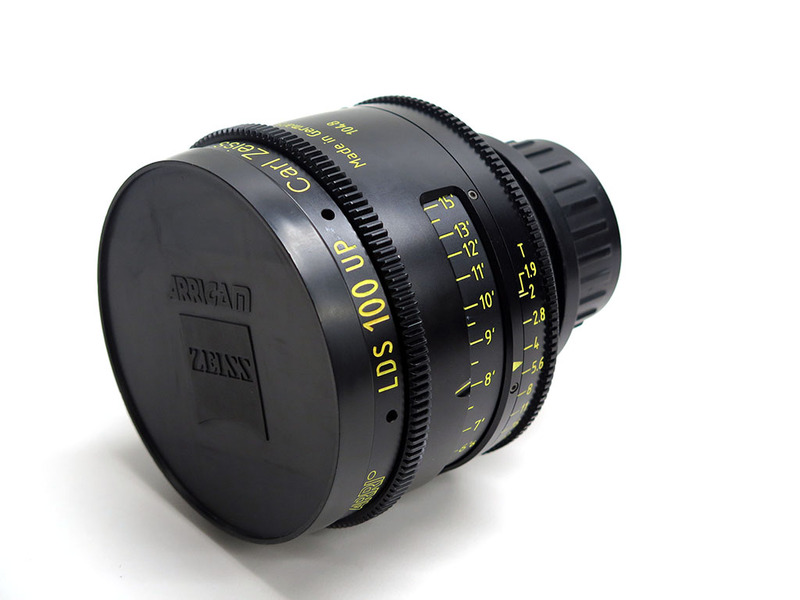 Has the signature Zeiss look, to match up well with other Zeiss / Arri lenses. Excellent color, contrast, skintones, CA performance. It's like a Master Prime but with the convenience of a zoom lens. This is PL mount but lens mount is interchangeable if you ever want to convert it to Canon EF, Nikon F, Micro 4/3, Sony E, etc. Works well for Super 35mm and 4K cameras, but is ideal for 6K/8K full frame cameras like Arri Alexa LF, Red Monstro, Sony Venice, Sony A7S II, Canon C700 FF. It works with basically anything you have or will have, so is a "future proof" versatile lens. Includes front/rear lens caps. This is in good cosmetic condition, with only minor paint wear on barrel, but no damage or signs of harsh use. Overall very presentable condition. Rings turn smoothly and consistently. No optical problems. Good working order, a strong example of this lens. The Red Mini-Mag Side SSD Module (part 720-0021) replaces the 1.8" Redmag module, allowing you to use Mini-Mag media on your DSMC (DSMC1) camera such as Red Epic/Scarlet Dragon or MX. It comes with the same record button, user keys, and EVF/LCD port as the original module. This has some cosmetic wear on Red Logo and nicks/paint wear. But overall is still presentable and undamaged. Tested on a Red camera with MiniMag to ensure it is in correct working order. The Redmag 240GB (part 750-0061) is a 1.8" SSD drive designed for use in the DSMC 1.8" SSD side module and the Red Station card reader. Provides a fast and reliable recording medium in a durable casing. Compatible with Scarlet-X, Epic-X, Scarlet Dragon, and Epic Dragon (not Red One). 240GB size, this is newer release than the 256GB version (current item on Red website). Shows minor paint and label wear, but overall in above average cosmetic condition compared to most. Tested in excellent working order. Multiple units are available. The Redmag 256GB is a 1.8" SSD drive designed for use in the DSMC 1.8" SSD side module and the Red Station card reader. Provides a fast and reliable recording medium in a durable casing. Compatible with Scarlet-X, Epic-X, Scarlet Dragon, Epic Dragon, and Red One (w/ appropriate 1.8" side module). 256GB size. Shows some paint wear and touchups, plus small amount of wear on rear label, but overall in good presentable condition with nothing that indicates rough usage. Tested in excellent working order. Multiple units available. Shows various paint wear and imperfections in finish, but no damage or anything that indicates rough usage. Rear label has some bubbles and wear. This has previous owner's name neatly etched/stenciled into front below Red logo. Tested in excellent working order. Multiple units available. The Redvolt battery (model 740-0020) is compatible with Red Epic and Scarlet cinema camera. The Redvolt lithium ion battery provides 37 Wh of power to your DSMC brain. This equates to a 20-35 minute range per battery depending on configuration. Can be hot swapped when camera connected to external power supply or when using Redvolt equipped DSMC Side Handle. May be used with battery module or inserted into a DSMC side handle for compact configurations. Minor cosmetic paint wear, but overall presentable. Charges up fully, showing 99% start percentage and all 3 LEDs on battery lighting up. This was tested to power Red camera in various configurations for 20-25 minutes, so it has at least 75% capacity. Multiple units available. The Sony AXS-512S24 is a high-speed 512GB flash memory card for recording high frame rate 4K and 2K 16-bit video onto the Sony AXS-R5 RAW recorder. The AXS-R5 docks directly to the PMW-F5 and PMW-F55 and via the HXR-IFR5 on the NEX-FS700, NEX-FS700R and PXW-FS7. This card has a guaranteed write speed of 2.4 Gbps and is compatible with the AXS-CR1 card reader. Includes case. Above average cosmetic condition with only minor wear. Tested in good working order on AXS-R5. Multiple units are available. The Sony AXS-R5 enables 4K and 2K 16-bit RAW video recording on the PMW-F55 and PMW-F5 Cinealta camera. Also can be used with the HXR-IFR5 on the NEX-FS700 and NEX-FS7. Attaches to the rear of the camera for a sleek integrated form factor. Can simultaneously record RAW files and proxy HD on the camera's SxS card. Matching time code, start frame, stop frame, file names, and other metadata for seamless confirming in post. Unlocks high frame rates up to 240fps in 2K RAW and 60fps in 4K. RAW recording preserves the greatest latitude for color correction and post. 16 times as many RGB gradations as 12-bit RAW nad 64 times as many tones per channel as 10-bit. Uses AXSM memory cards such as the AXS-512S24 and AXS-A1TS24 / AXS-A1TS48 / AXS-A512S24 with adapter (adapter not included). Very low usage of 72 hour on meter. Latest firmware V4.10 installed. Fully tested in good working order on a PMW-F55 and FS700, unlike some sellers who are unable to test this or even gather the hour meter reading. Clean cosmetic condition overall, with only minor wear. Multiple units are available. The Sony HKC-HB15 Fiber Transmission Unit is an upgrade to the HDC-1500 or HDC-1500R camera, doubling the signal transmission bitrate to 3G. Cameras upgraded with this enhanced capability are able to work as a complete 1080/50p or 1080/60p production system. Supports RGB 444 signal output from the CCU. The new high bitrate capability can be used in Trunk Line mode to connect two cameras to two CCUs via single cable. 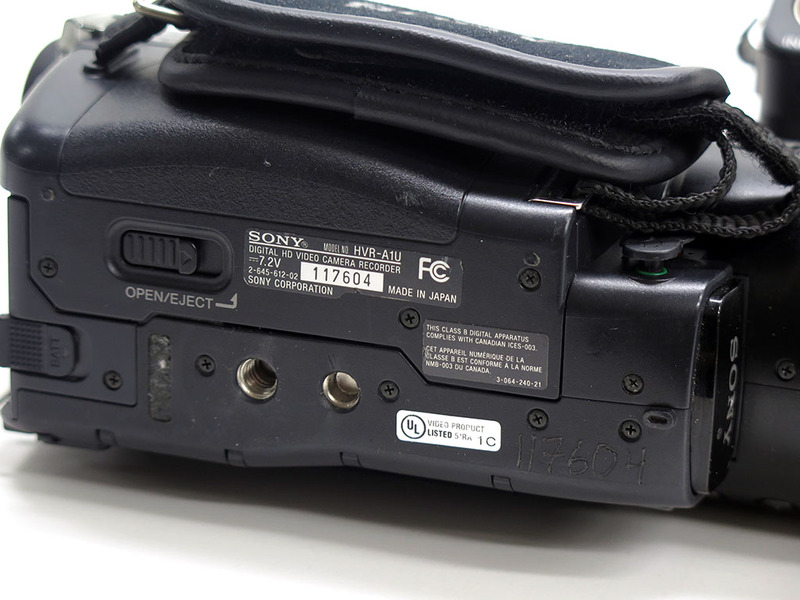 Alternatively, two cameras can be can be connected to one CCU, where the Sub camera's remote signal is added to that of the the Main camera. Both can be controlled separately from RCPs. Tally, Intercom and Audio do not function on the Sub camera in this operational mode. Can be configured to supply a signal to an HD SDI prompter for high quality prompting, or it can supply a floor monitor system. This is new in box. This was "old stock" that was never installed or used. Comes with original box and all factory parts, only opened to ensure contents. Note that this is a somewhat complex installation with a lot of parts and requires a comfort level equal to installing upgrades in a computer for example. There is instructions available which are not hard to follow, but if you are uncomfortable doing the upgrade, it would be advisable to have a qualified technician assist. Multiple units are available in the same condition. 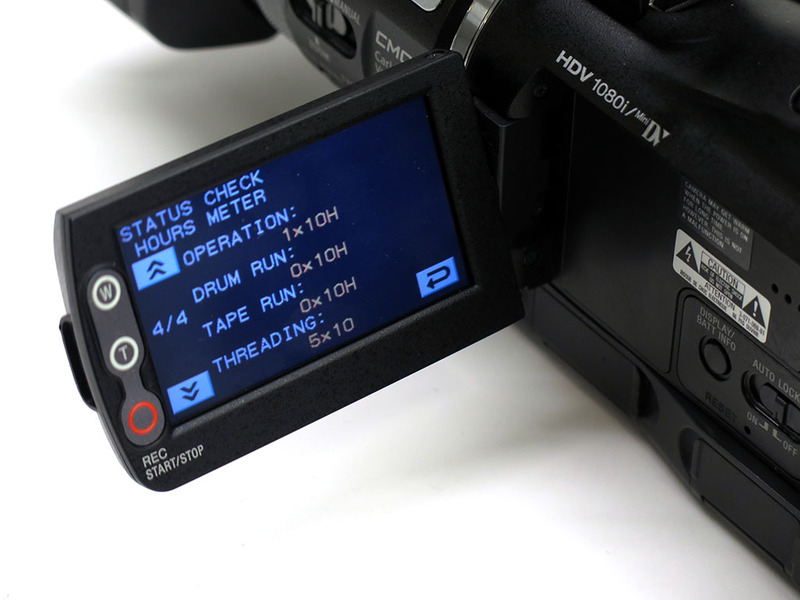 The Sony HXR-IFR5 interface unit connects your 4K ready NEX-FS700, NEX-FS700R, or NEX-FS7 camera (with XDCA-FS7 extension) to the AXS-R5 RAW recorder. It enables camera's 2K and 4K RAW files to take advantage of the RAW workflow of Sony PMW-F55 and F5 cinealta cameras. 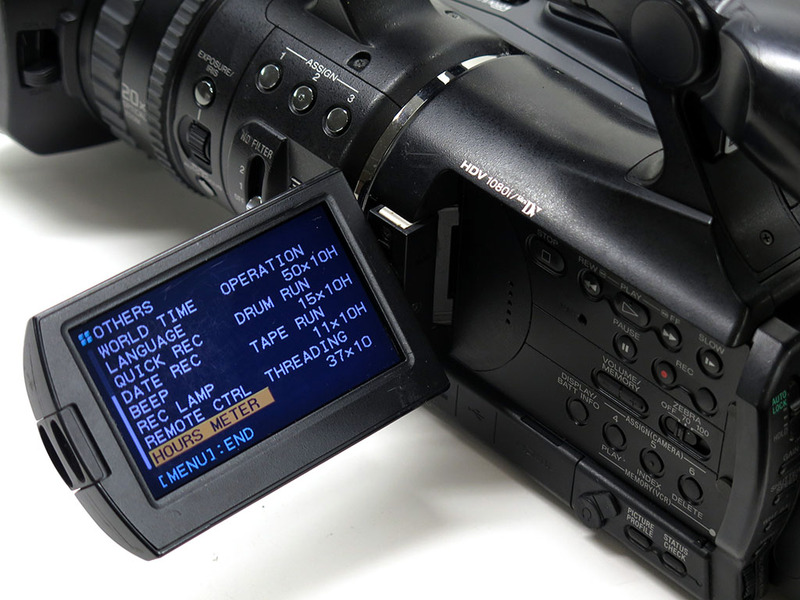 Receives the uncompressed bistream carrying RAW sensor data, metadata, timecode, and start/stop commands via 3G-SDI. Allows simultaneous recording (4K on AXS-R5 with HD on the FS700). Features built-in LCD status panel and large tactile control buttons. This includes an Ikan mount that allows attachment to 15mm rod / rails. Cosmetically very good with little signs of wear except some on the Ikan mount. Tested with a FS700 and AXS-R5 combo to be in good working order. The SBP-64C is a 64GB SxS Pro+ memory card, designed for high-speed video recording with XDCAM / XDCAM EX camcorder. This is ideal for 4K and high data rates on the PMW-F5 and PMW-F55 cinealta camera (unlike the previous SBP-64 / SBP-64A card which is not suitable). Of course, this can also be used with any model that takes an SxS / ExpressCard such as PMW-500, PMW-300, PMW-320, PMW-400, PMW-200, PMW-100, PMW-160, PMW-EX1R, PMW-EX3, PXW-X200, PXW-X180, PXW-X160, PXW-X400, PXW-X500, PXW-X320, PMW-RX50, PMW-PZ1, PMW-50, PMW-F3 and more. This features around double the read/write speed of the previous generation SBP-64B. Maximum read speed of 3.5Gbps and write speed of 2.8Gbps (minimum read speed of 1.3Gbps). This faster speed is useful for ensuring stable high frame rate recordings in formats such as XAVC 4K 60P or XAVC 4K 180P. Also has improved safety features such as data refreshing, error correct, and power failure management. Example recording times: 20-32 minutes in 4K XAVC, 10 minutes in 4K XAVC 4:2:2 60P at 600Mbps, 60 minutes HD XAVC Intra 4:2:2, and 120 minutes in HD MPEG2 4:2:2 30P at 50Mbps. Maximum recording time possible is 200 minutes at 35Mbps. This SxS Pro plus card is the ultimate memory card that can support any codec or camera model out there. Mint cosmetic condition and tested in excellent working order. Includes case (no label on case). Multiple units available. The Sony SNCA-ZX104 is a hybrid 4-channel receiver, allowing you to seamlessly integrate images from 4 different hybrid cameras - enabling their easy and cost-effective migration towards HD IP video surveillance / security systems. Offers 4x BNC camera input and 4x BNC analog video output, as well as LAN and remote RS-485 connection. This is new in the box with all the accessories from the factory. First two pictures are stock photo. Multiple units available. The Sony SR-256S55 SRMemory Card is a 256GB ultra high-speed reliable flash memory media for SRMaster series products. Compatible with F65 camera (with SR-R4), SR-R1000 memory storage unit, SR-R1 portable memory recorder, SR-PC5 / SR-PC4 data transfer units. Transfer speeds up to 5.5 Gbps in order to record and replay multiple streams simultaneously, high frame rate (HFR), and support data rates that can handle HD up to 4K (YPbPr422, RGB444, 1080 59.94p, 3D, 4K, and uncompressed). With 256GB capacity, can record over an hour at 1080/25P, for example. If you see the original MSRSP of these, you'll see this is an insanely deep discount! Excellent cosmetic condition, with only a scratch on the front. Good working order. The Sony SR-512S55 SRMemory Card is a 512GB ultra high-speed reliable flash memory media for SRMaster series products. Compatible with F65 camera (with SR-R4), SR-R1000 memory storage unit, SR-R1 portable memory recorder, SR-PC5 / SR-PC4 data transfer units. Transfer speeds up to 5.5 Gbps in order to record and replay multiple streams simultaneously, high frame rate (HFR), and support data rates that can handle HD up to 4K (YPbPr422, RGB444, 1080 59.94p, 3D, 4K, and uncompressed). With 512GB capacity, can record up to 2.5 hours at 1080/25P, for example. If you see the original MSRSP of these, you'll see this is an insanely deep discount! Excellent cosmetic condition, with only a scratch on the front. Case has small crack, but still closes fine. Good working order. The Chrosziel 401-FS5 is a Lightweight Support for the Sony PXW-FS5, featuring a sliding ergonomic shoulder pad that turns your FS5 into a balanced shoulder camera. Has 2 Hirth rosettes for adding hand grip / handles and 15mm front rod clamps. The Chrosziel C-401-457KIT3 consists of a 401-457 LWS 15mm light weight support, 401-BP15B mounting plate, 3050-02 MultiPad straight shoulder pad, 401-83-190 15mm extension rods, 403-31 190mm bar with rosettes for handles, and a 403-30 leather handle / grip. This package is ideal if you are using the 4K RAW upgraded NEX-FS700 / NEX-FS700R with HXR-IFR5 and AXS-R5. 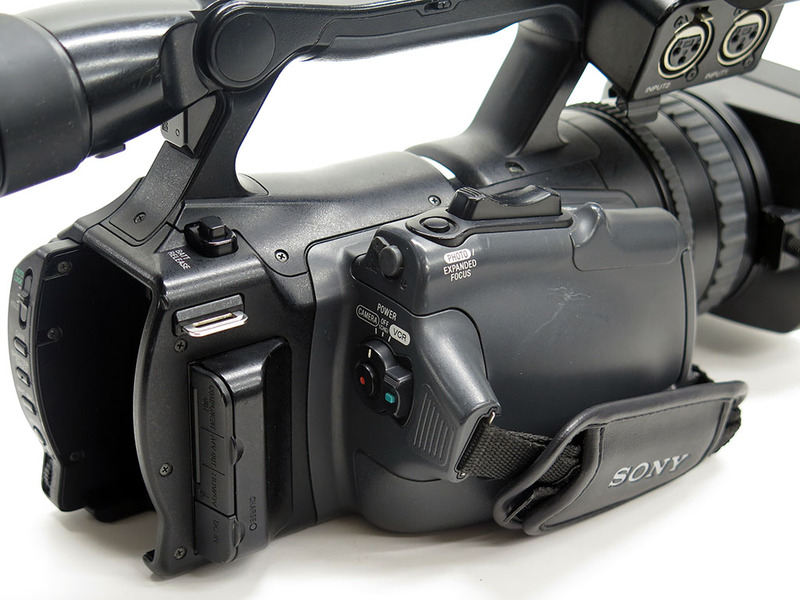 Though it is also ideal for a third party recorder or a NEX-FS700 with battery plate at rear for large battery (such as Anton Bauer gold mount, IDX v-mount, and PagLok). 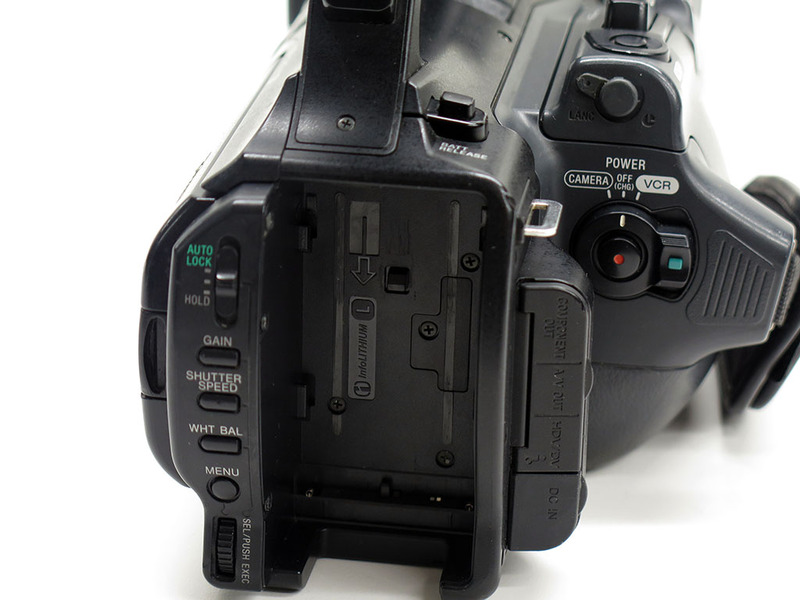 The shoulder pad consists of a rod bracket which the pad slides onto, with ability to adjust pad behind or directly underneath camera to your liking. With the lower rods and shoulder pad removed, this kit can be attached to tripod or other support. 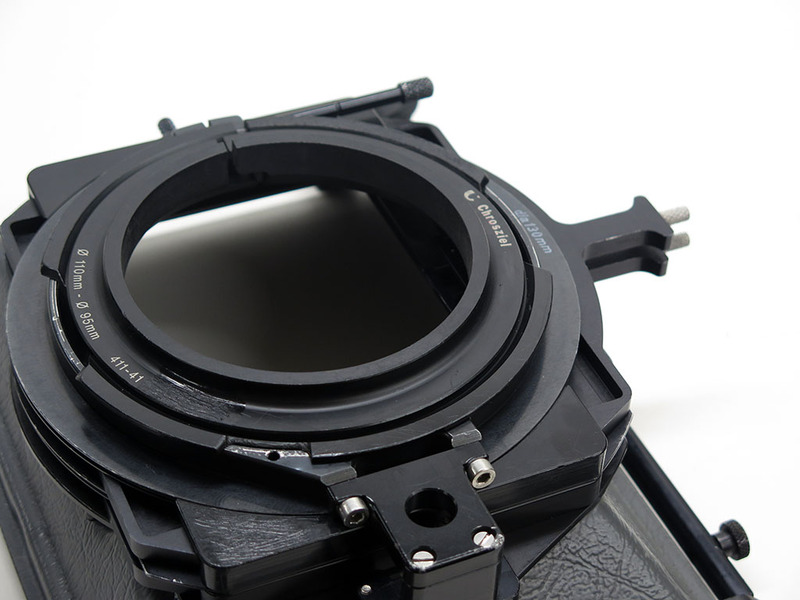 The front rods are ideal for mattebox, follow focus, and more. Handles can be attached via industry standard rosettes. Includes one leather handle, not two. It is in mint "like new" condition with almost no signs of use. The Kino Flo KIT-140X 12V Single Kit (featuring 2x 15" flourescent fixtures and ballasts) is a portable compact lighting system, ideal for tight cramped interiors such as bus, car, elevator, aircraft, or other areas that can't be reached via an external light source - or anywhere where a smaller amount of extra light is required or a larger fixture cannot be placed. Each fixture produces 16 footcandles at 3 feet. Dimmable to 15% of full power. These are light enough to velcro or gaffer tape to anything, though can also be stand mounted with optional MTP-K1 mount plate. Other features include flicker-free, instant-on, removable lamp harness, focusing louver, compatibility with True Match daylight and tungsten lamps, and can operate 25' away from the ballast via extension cables. This includes 2x 12V Single fixtures, 2x louvers, 2x ballast with 4-pin XLR cables, 2x 25' extension cables, DC Alligator Clip cable for powering from car battery, 2x DC car plug for powering from cigarette light socket, 2x power supply (generic brand) for powering from 100-240V AC power, 3x 5600K lamps, 3x 3200K lamps, lockable hard travel case with keys, and operation manual. This does not include power supplies and lamps from factory, so this is a lot of extra value. This is a former rental unit, so there is stickers and name etching in many areas. There is dent on one side of carrying case, but still closes very well. There is some cosmetic paint wear and scratches on items, but overall in good shape with no damage. All of it is tested to be in very good working order. The Litepanels Hilio H72 (907-1001) is a small 10x14" footprint yet powerful LED light fixture capable of throwing daylight balanced 5600K illumination over a 20-25' (6.1-7.6m) distance. This functions as an HMI replacement with the equivalent luminance output of a 650W HMI fixture (or 1000W conventional tungsten). Ideal for exterior or interior use. Uses 95% less energy than conventional lights. Comprised of 72 one watt daylihgt LEDs focused to a 15 degree angle. Can dim from 0-100% without color shift, controllable via DMX or local dial. Filter slot holds two gel filters on front. Standard yoke design for easy positioning with 1–1/8" (28mm) diameter detachable junior pin. Integrated rear gimbal plate for accessory attachments. Has a silent mode switch to turn off cooling fans (if they come on) for critical shots where silence is desired. Very rugged housing and multi-voltage power supply for worldwide use. This includes AC adapter power supply mounted to rear plate, power cord, and a 5 filter set (Full CTO, 1/2 CTO, 1/4 CTO, 1/8 CTO, and 1/2 white diffusion). This also will come shipped in a hard case for added protection. Cosmetically has some scuffs and paint wear, but overall in very presentable clean condition. It is missing the knob cap for the dimming knob, but dimming is still easily controlled by turning the shaft (so this is cosmetic only). Tested in excellent working order. 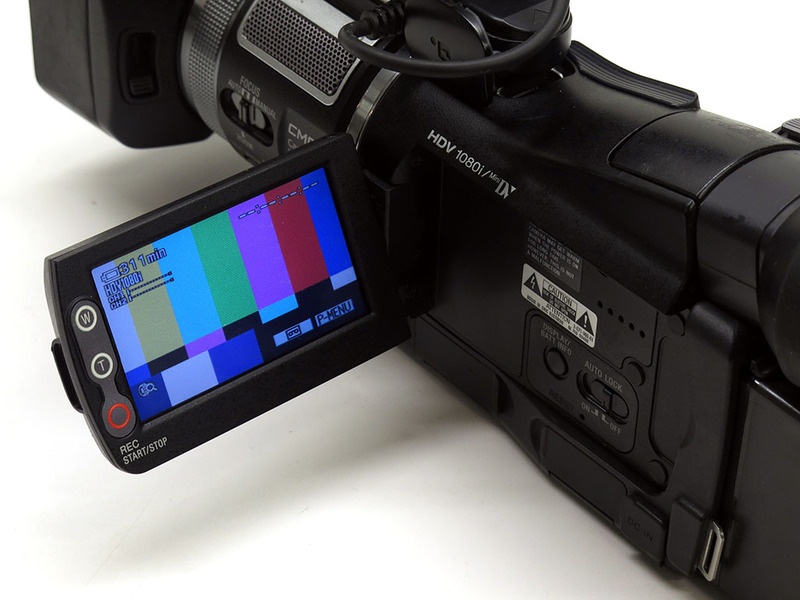 The AG-BS300 (AG-BS300P / AG-BS300PJ) Digital Base Station is the core of the Panasonic P2Studio and 300Studio camcorder systems. Connects to the AG-CA300G / AG-CA300 (not included) camera adapter via 2 BNC cables and power cable to allow transmission of HD images, return images, tally, mic genlock distances of up to 100 meters (328 feet). One might also wish to add AJ-RC10G remote controller or AG-EC4G to complete the studio package. 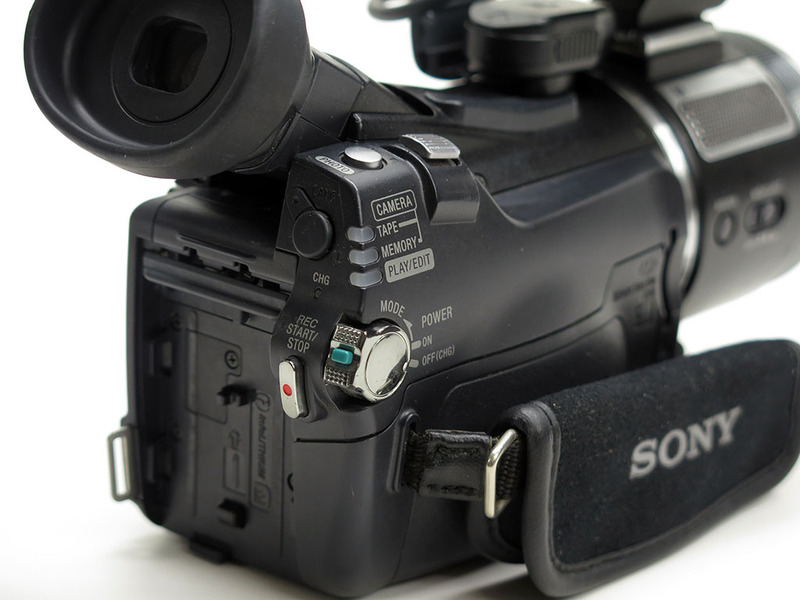 Supported camcorders include AJ-PX380, AG-HPX300, AG-HPX500, AJ-HPX3700, AJ-HPX2700, AJ-HPX3000, AJ-HPX2000, AJ-HDX900, and more. Studio300 cables (not included) are available in 25, 50, and 100 meter lengths. Digital signal transmission ensures high-quality, degradation-free images. 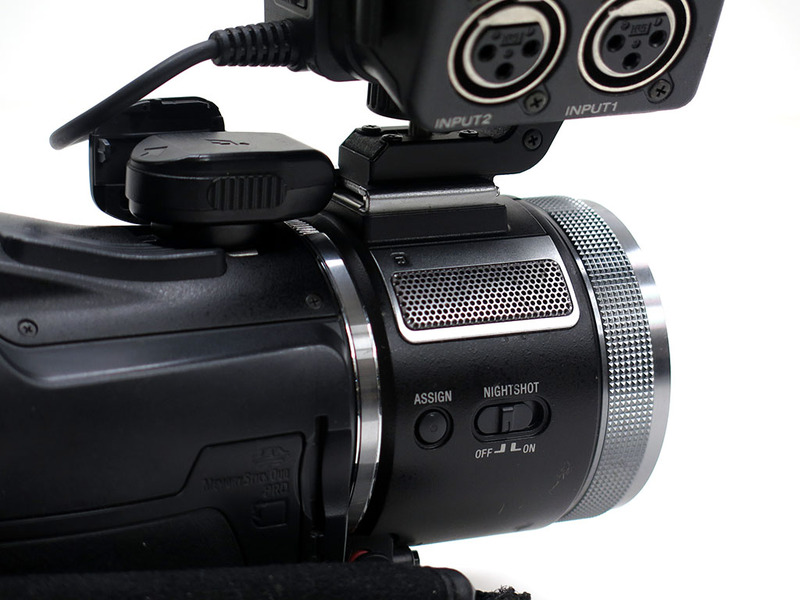 Up to 70 watts of power can be supplied to the camcorder,* and a compact monitor and servo zoom can also be driven. Supports both AC (100 to 240 V) and DC (12V) power supplies. Features two HD-SDI / SD-SDI outputs and composite output. Menu, intercom, and tally/call functionality on front. Rackmountable configuration. Cosmetically clean with only minor scratches on top. This does not include any other parts of the studio system or any cabling. This is only for the AG-BS300 base station as pictured. We were unable to test this ourselves with full system because we don't have all the parts, but this did come from working environment and will still be guaranteed as fully functional with our 30 day warranty. The Canon EF 50mm F1.0 L USM lens is an exceedingly rare super lens. It is the most advanced 50mm lens. Not only the fastest, but packed with technology such as two ground aspheric elements, autofocus, electronic focus, focus-by-wire, ultrasonic focus motor, and electronically actuated diaphragm. Ultra low light ability (1/2 to 2/3 stops faster than f/1.2 lenses). If you want to shoot in available light at high enough shutter speed to stop action in very low light, you need this lens. Provides a unique bokeh and extreme subject isolation with shallow depth of field that can't be duplicated by lesser lens - background can virtually disappear if needed. This is designed to be sharp and contrasty even wide open, though you need to focus perfectly for best results at f1.0 due to the extremely shallow depth of field. By design, there is strong falloff (vignetting) in corners at f1.0 especially in lower light conditions, minor at f/1.4, and no more at f/2. Useful for isolating the subject, though can easily be corrected in Photoshop if needed. This has instant manual focus override. Note the focus ring is an encoder that tells the motor what to do, so the manual focus will not operate unless lens is awake and communicating with body. This has a minimum focus distance of .6 meters (2 feet), so understand that you cannot focus on objects extremely close to the lens. It may have been made a long time ago, but has abilities that no other lens today can really match, even with some limitations as a result. This is not only a powerful lens, but a real collector's item. Includes hood and lens caps. Cosmetically this has some paint wear and scratches on body and brassing on mount - but overall presentable and nothing that exceeds what a professionally used lens with some years on it would exhibit. No scratches or marks on front and rear glass. There is some internal dust, most noticeable underneath the rear element - which does not affect optical quality and is rather typical (it is almost impossible for internal dust to cause any issues except if unusually abundant or shooting in unusual conditions). There is one anomaly in manual focus, when one moves ring past infinity limit quickly it can make a squealing/squeaking noise, presumably from the motor, though this is not consistent. One really wouldn't do this under normal circumstances, but just wanted to point everything out. Overall this functions extremely well in terms of sharpness, optical quality, autofocus, manual focus, aperture function, etc.